Caterina is Senior Post-doc at the Italian Institute of Technology in Genoa. She received her master degree in Neuropsychology in 2004 and her PhD in Cognitive Science in 2007 from the University of Padua. 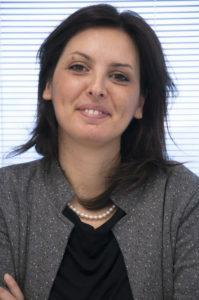 After her PhD studies, she got a two-years postdoctoral fellowship at the University of Padua to investigate the complex relation between intention and action by means of kinematic techniques. For I.Move.U project, she applies a new quantitative methodology to the investigation of intention understanding in both clinical and non-clinical population. Crajé C., Lukos J. R., Ansuini C., Gordon A. M., Santello M. (2011). The effects of task and content on digit placement on a bottle. Experimental Brain Research, 212, 119-124. Castiello U., Giordano B. L., Begliomini C., Ansuini C., Grassi M. (2010). When ears drive hands: the influence of contact sound on reaching to grasp. Ansuini C., Begliomini C., Ferrari T., Castiello U. (2010). Testing the effects of end-goal during reach-to-grasp movements in Parkinson’s disease. Brain and Cognition, 74, 169-177. Ansuini C., Grigis K., Massaccesi S., Castiello U. (2009). Breaking the flow of an action. Experimental Brain Research, 192, 287-292. Castiello U., Ansuini C., Bulgheroni M., Scaravilli T., Nicoletti, R. (2009). Visuomotor priming effects in Parkinson’s disease patients depend on the match between the observed and the executed action. Ansuini C., Giosa L., Turella L., Altoè G., Castiello U.(2008). Experimental Brain Research, 185, 111-119. Tubaldi F., Ansuini C., Tirindelli R., Castiello U. (2008). Odours grab his hand but not hers. The grasping side of odours. Tubaldi F., Ansuini C., Demattè M. L., Tirindelli R., Castiello U. (2008). Effects of olfactory stimuli on arm-reaching duration. Lukos J. R., Ansuini C., Santello M. (2008). Anticipatory control of grasping: independence of sensorimotor memories for kinematics and kinetics. The Journal of Neuroscience, 28, 12765-12774. Lukos J. R., Ansuini C., Santello M. (2007). Choice of contact points during multidigit grasping: effect of predictability of object center of mass location. The Journal of Neuroscience, 27, 3894-3903. Ansuini C., Santello M., Tubaldi F., Massaccesi S., Castiello U. (2007). Control of hand shaping in response to object shape perturbation. Experimental Brain Research, 180, 85-96. Ansuini C., Tognin V., Turella L., Castiello U. (2007). Distractor objects affect fingers’ angular distances but not fingers’ shaping during grasping. Experimental Brain Research, 178, 194-205. Ansuini C., Pierno A. C., Lusher D., Castiello U. (2006). Virtual reality applications for the remapping of space in neglect patients. Restorative neurology and neuroscience, 24, 431-441. Ansuini C., Santello M., Massaccesi S., Castiello U. (2006). Effects of end-goal on hand shaping. Journal of Neurophysiology, 94, 2456-2465. Castiello U., Zucco G. M., Parma V., Ansuini C., Tirindelli, R. (2006).